A great way to get to know the wines of an area is to visit the area, visit wineries, taste the wines, talk to the winemakers, eat at local restaurants, and order local wines with your meal. It is even better if you can buy and take home some of the wine, as it usually requires drinking multiple bottles to really get to know a wine. This is a proven method and in such a way we have discovered the wines of Sancerre/Pouilly-Fumé (Loire, France), Burgundy (France), and many regions in Italy including Piemonte and Alto Adige (Südtirol). Even though many wine regions in Germany are a lot closer (as close as only 3 hours from Amsterdam), we had not visited those areas yet. It was about time that we did, as Germany has a lot of great wines to offer. And so we drove to Germany for a weekend to eat at Schanz and Vendôme, but mostly to start making an acquaintance with the local wines. 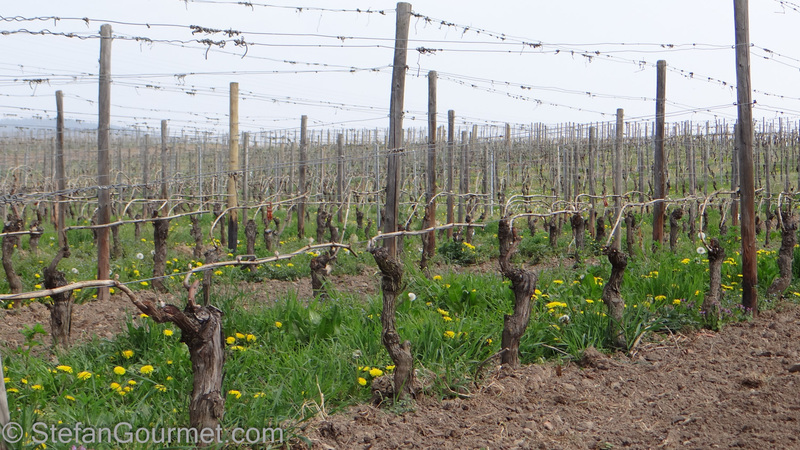 In this post I will first explain the German wine classification. 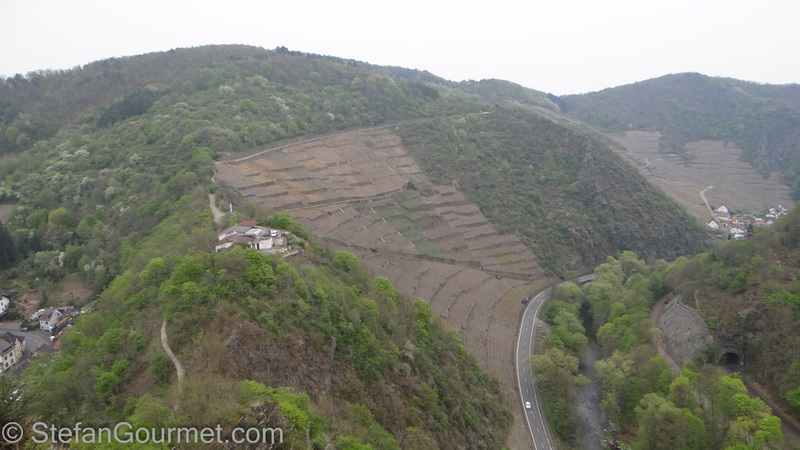 Then I will tell you about the wine regions that we visited: Mosel, Rheingau, and Ahr. When you know how to read a wine label of French or Italian wines, this does not automatically mean that you will also understand the labels of German wines. Although I had read about German wine classification before, it took this trip to Germany for me to really figure it out. The classification system of German wines is different from French or Italian wines, where Appellation d’Origine Contrôlée (AOC) and Denominazione di Origine Controllata (e Garantita) (DOC(G)) prescribes that a wine should be produced from certain types of grapes in a certain area, and comply with quality criteria that are different for each appellation (such as a maximum yield per hectare, or a minimal bottle aging period). The idea behind this is that when the rules are followed (such as using a grape variety that is well adapted to the area), the wine will be of good quality. This means that when you buy an AOC or DOC(G) wine, you know more or less what to expect. It also means that the area where the grapes were grown is the most important characteristic, sometimes even considered more important than the grape variety. Burgundy takes this to the limit by distinguishing the terroir of each small vineyard. Unlike in Italy and in most of France, in Germany it cannot be taken as a given that the grapes will ripen sufficiently. If you think about it, the Ahr wine region in Germany is at a latitude of 50 degrees North, which is north of Canadian cities such as Vancouver or Winnipeg. And so it is not so strange that the quality of Germany wine is measured first and foremost by the sugar content of the grapes at the time of harvest. The sugar content is measured as “degrees Oechsle”, which is actually a measure for the density of the grape must. The amount of sugar in the grape must determines how much alcohol the wine potentially can have. For example, 50 degrees Oechsle means 5.9% potential alcohol by volume. Spätlese means late harvest (spät = late, lese = harvest). Auslese means late harvest with selection of the best bunches of grapes. Beerenauslese means that the best berries (Beeren) are selected from each bunch. In this case, the ‘best’ berries means those that have been affected by botrytis (noble rot, Edelfäule). Trockenbeerenauslese means that berries are selected that are dry (trocken) like raisins. All of this used to confuse me, because I thought this meant that a sweeter wine was automatically a higher quality. What I found out during my trip, is that besides the ‘quality’ of the wine (Kabinett, Spätlese or Auslese), you also need to know the alcohol by volume of the wine to be able to tell whether it is dry or sweet (or something in between). The ‘quality’ only tells us the sweetness of the grapes at the time of harvest. It depends on how much of that sugar is allowed to be transformed into alcohol, how much residual sugar there will be in the actual wine. And so an Auslese can be less sweet than a Kabinett! And of course a good Kabinett can be of higher quality than a bad Auslese. Edelsüß (noble sweet), above 18 grams per litre and affected by botrytis. If there is no indication on the label but you do know the ‘quality’ and the alcohol by volume, you can figure it out for yourself. Let’s check out the labels of these bottles (click on the picture to enlarge). Beerenauslese, 6.5% alcohol. Very sweet. Kabinett Feinherb, 10% alcohol. Semi-dry. Großes Gewächs (which means at least Spätlese ripeness), 13%. Dry. Großes Gewächs (which means at least Spätlese ripeness), 12.5%. Dry. Something I noticed during my trip, is that Auslese wines often are designated as *, **, *** or *** Goldkapsel (golden capsule). Auslese* means that one further selection has taken place after the first selection in the vineyard. This means that the bunches of grapes are divided into two: Auslese and Auslese*. Even further selection will lead to ** and ***, and finally “Goldkapsel”. 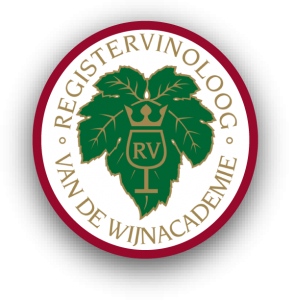 The German association of quality wineries (VDP, Verband Deutscher Qualitäts- und Prädikatsweingüter) has tried to make things easier for international wine lovers by adopting a system that is based on that of Burgundy. The best wines are called Großes Gewächs, which are grown in a Große Lage (Grand Cru) vineyard. Next comes Erste Lage (Premier Cru), followed by Ortswein (compare to “village” from Burgundy), and finally Gutswein. Wines using the VDP classification system are dry (Qualitätswein Trocken), unless they are labelled as Kabinett, Spätlese, Auslese, etc. 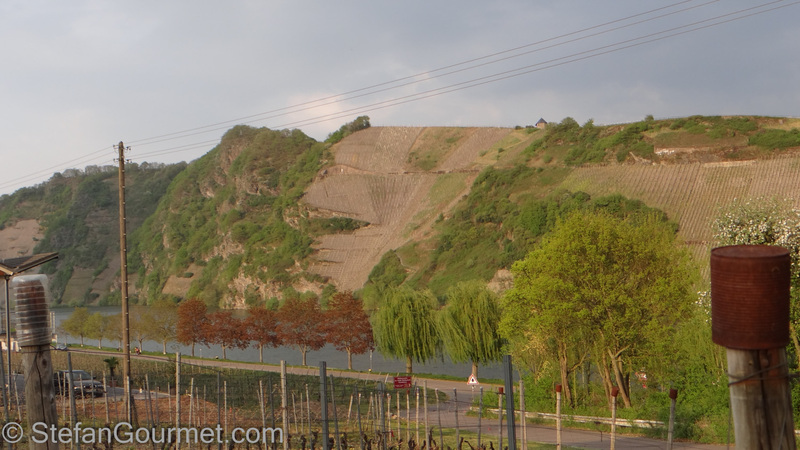 The Mosel is a very bendy river that has very steep vineyards (Steillagen, Steil = steep, lage = vineyard) along its banks. The soil type here is slate (Schiefer). The best vineyards are those exposed to the south, sometimes with “Sonnenuhr” (sundial) in their name because the sundial is located in the spot that gets most sun. For example, the best part of the Brauneberger Juffer vineyard near the town of Brauneberg is called Brauneberger Juffer-Sonnenuhr. 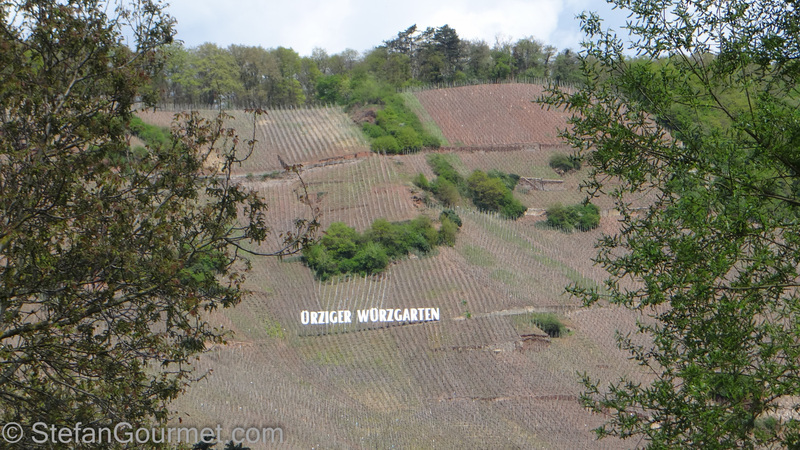 The names of the vineyards are sometimes shown, like Ürziger Würzgarten here (Ürzig is the name of the town, and Würzgarten means herb garden). The Mosel is famous for its whites made from riesling grapes, and most of them sweet or semi-dry. Such wines are great when paired with Asian food. The first winery we visited was Karl Erbes in the town of Ürzig. Mosel rieslings are very well suited to long aging. Both the sweetness and the acidity will mellow with age, while a special nose will develop that is known as “petrol”. It actually does remind of petrol, but in a pleasant way. At Karl Erbes we tried some old vintages, including a 2003 Auslese**, a 2004 Spätlese, and a 2005 Auslese, all from Ürziger Würzgarten. They all had a great balance between sweetness, acidity, minerality, and some nice petrol. Our next visit was Jos. Christoffel Jr., at walking distance. Like Karl Erbes, this is a family estate that has been around for centuries. Although some semi-dry wines are produced, most are sweet. Karl-Josef Christoffel told us that according to him a good Mosel riesling has no more than 7.5% alcohol. He prefers sweet wines and actually grimaced when he tasted his own halbtrocken and feinherb wines. Again there were a lot of wines available for sale and to be tasted, about 60. Here the wine tasting was in the living room of the beautiful old house. All the wines are from Ürziger Würzgarten and Erdener Prälat, and also here old wines are for sale as well (as far back as 1994). 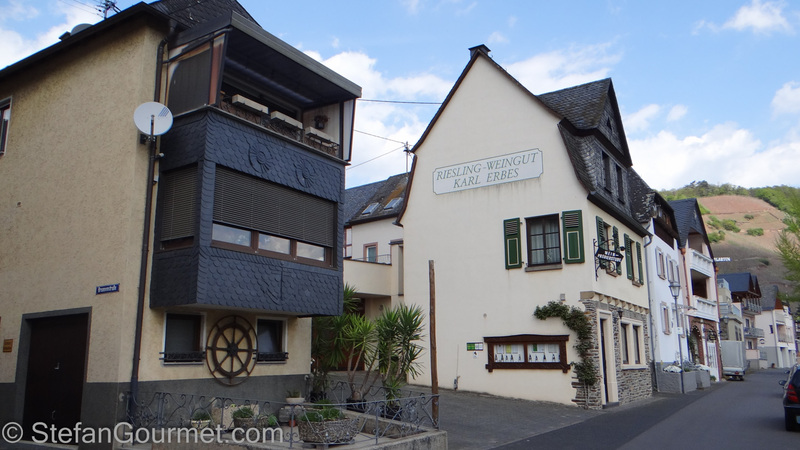 Our final stop in Mosel was at Willi Haag in Brauneberg. The wines here are from the Brauneberger Juffer vineyards, that have a very special minerality. I didn’t like it in the dry wines, but in the sweeter wines it was great. Marcus Haag allows us to taste a lot of wines, many of which from older vintages that in this cases were not for sale anymore but only to try. He told us that he lets people taste the older vintages so you know what will happen to the wines if you keep them for a while. 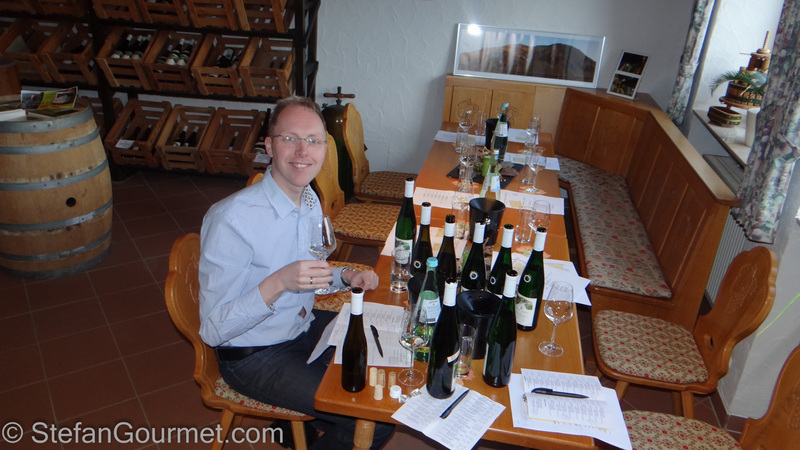 Mosel is known for its sweet wines, and the producers we visited (especially Jos. Christopher Jr.) specialize in sweet wines. There are however also wineries that make dry wines, like Clemens Busch and Heymann-Löwenstein. They are often made from Spätlese or Auslese grapes, making them dry but rich. 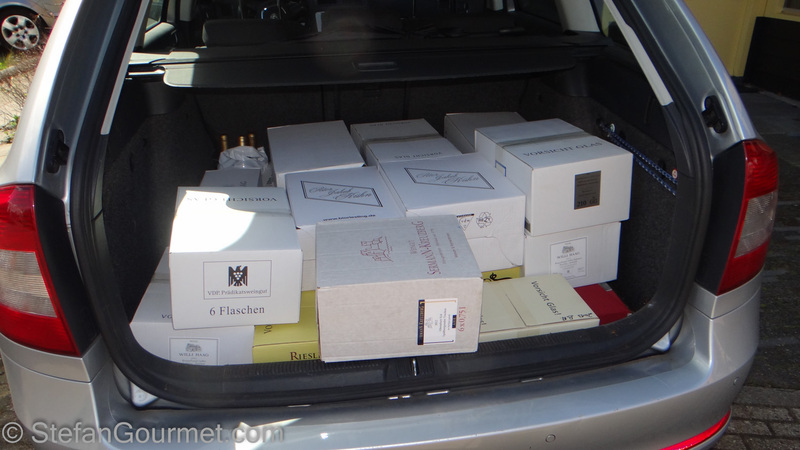 The next day we went to the Rheingau. This wine region near Frankfurt is on the south-facing slopes of the Rhine river. The slopes are not nearly as steep as the Mosel, and the soil here is loam and löss with quartz. Rheingau is also mostly riesling, but unlike Mosel most wines here are dry. 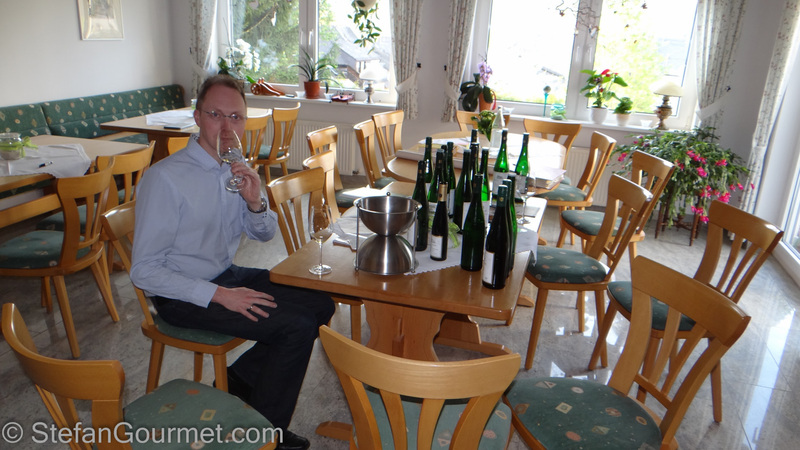 We visited two wineries, Peter Jakob Kühn and Spreitzer. Not only the style of wines is different here, also the reception. In Mosel we got a lot of personal attention, here it was more business-like. The wines have interesting minerality and are very dry. The final area we visited was the Ahr, closest to home. The Ahr is a bendy river like the Mosel, and also like the Mosel the slopes are steep and the soil is slate (with loam and löss). Ahr is the realm of the Spätburgunder (Late Burgunder), a clone of the pinot noir that actually does become ripe here due to the microclimate and the late harvest. The Frühburgunder (Early Burgunder) also exists, which is an early ripening variety. With some help of barriques it is still amazing how full-bodied these red wines are. More full-bodied than many reds from Burgundy. Not to mention that they have as much as 13.5 or 14% alcohol by volume. The only drawback is that they they don’t come cheap. We visited the Serman-Kreuzberg winery for some nicely priced Ahr Spätburgunder, and really liked it. We really liked our visit to Germany and will be back. What a wonderful tutorial on German wines! I love the photos of you and all of the bottles!!! It seems like a lot of Americans overlook riesling, but it’s my favorite for sipping. And the off-dry varieties in Germany are fabulous. I’ll never forget driving through Switzerland and seeing the steepness of the vineyards!!! They must have to pick grapes by helicopters!!! The steepness of the vineyards is what makes these wines expensive, as everything has to be done by hand. What a fascinating explanation of German wines. You are very luck to live in such close proximity to so many wineries! sono d’accordo con te, per conoscere i vini bisogna andare a visitare le cantine e degustarli assieme al produttore. Quando viaggio, se acquisto vino lo faccio direttamente nelle aziende. So much great information about German wines, Stefan. My brother-in-law works in Germany and has for some time. This blog post definitely inspires me to visit even sooner with The Swedish Pop Band. The dry wines sound lovely and appeal to me. I’ll surely be filing this for extra wine knowledge – great information! Thank you for doing some rather enjoyable ‘homework’ 🙂 ! As my husbands and I were not particularly fond of wines produced in the area [and, yes, I have had ‘wine stays’ on multiple times, gone right thru’ to Trockenbeerenauslese!] Much of personal remembrance comes form brief stays in Rüdesheim/Rhine. For my ‘Chablis’ oriented palate most of the wines were simply too ‘fine’ I guess [laughing!!] but SO glad to have your experience and expertise!!! Chablis is geographically not that far from Mosel, but in terms of taste sweeter Mosel rieslings are something completely different indeed. Not sure if I would call either one more ‘fine’. [smiling] As you may have noticed/will notice my somewhat ‘uneducated palate’ [yup, in spite of all the glasses enjoyed!] loves the tinder dry and most Chablis I have had the chance to enjoy allow me that! Thank you for taking the time to gather, organize, and publish this tutorial. I’ve pinned it for I know I’ll come back to it again and again.